Danilo Rossi, first viola of the Orchestra of the Teatro della Scala, together with the cellist Mario Brunello, will present the book “24 giorni di studio” (“24 days of study”), an innovative collection of technique exercises for viola. The book contains 24 lessons for 24 days, and is inspired by the namesake work by Mario Brunello, who, in 2015, had the idea to collect some exercises for cello regarding all the aspects of technique. Both of the books are published by Antiruggine, Mario Brunello’s cultural association, that organizes events and exhibitions dedicated to music and theatre in Castelfranco Veneto. “This idea was born thanks to Mario Brunello’s book – Danilo Rossi explained – because it dealt with study in a different way. Usually methods are very specific, so when you study you usually have to use something like ten books. On the contrary, in “24 giorni di studio” there is a bit of everything. The aim, a little ambitious but not presumptuous, is to put on paper the basics of technique to say, ‘OK guys, this is the way I do it’. More important, “24 giorni di studio” teaches how to study in a fun way”. “What was missing in our field – Mario Brunello continued – was a sort of diary to stay in shape or to recover after a period in which you cannot study enough. Even with the best will, studying technique with all those books is impractical. The idea of “24 giorni di studio” was inspired by the approach that my teacher Antonio Janigro taught me, as he used to give me a bunch of 4-bar-long exercises, that day after day became more difficult. Then I asked Danilo Rossi to write his book and he put his personality in it, together with his method to teach and study. After this volume about the viola and the one about the cello I would like to complete the collection with a book about the violin and piano”. 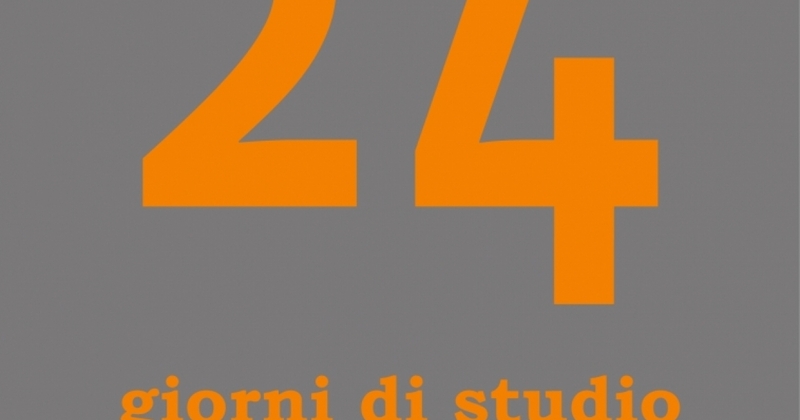 “24 giorni di studio”, as the name suggests, is organized in 24 daily lessons of technique for viola, each one dealing with many topics, that are successively recalled in the following days. A structure that Danilo Rossi called “a spider web”. The number 24 was chosen because it is a recurrent number in the world of music, as Rossi and Brunello note: the scales, the tonalities, Paganini’s Caprices and the work days in a month are all 24. Every lesson contains a different scale and much more, including a piece, in the tonality of the day, to give the musician satisfaction and, as M° Rossi said, “to think musically, to put what you learn at the service of music”. This method is for everyone, for both the professional musicians and the amateur with 3-4 years of study behind him. “Something I particularly liked in M° Brunello’s idea – Danilo Rossi explained – was that it is useful for every musician. In my book every lesson is supposed to last an hour, on average, but it depends on the ambitions of the musician, if you want you can study it two hours a day or even more”. “To write this method I developed the exercises I used to do as a kid – M° Rossi continues – putting into them the things I learned from my teachers, Piero Farullo, Dino Asciolla and Yuri Bashmet. At the end of this book, then, there is a chapter to learn to “think musically”. A lesson that I learned from my teachers and I consider very important is not to underestimate the quality of sound. Technique is important, and you can get faster and more agile, but the most important thing is the search for a good viola sound”. In some exercises musicians are helped by video lessons, on Youtube. Much attention is dedicated to a topic that today is really important, focus: “Focus and fear of playing are themes that often recur, and I think they are strongly linked. It is normal to be afraid, even if nobody likes to talk about fear, if you don’t have the right tension you risk taking things too lightly and playing badly. Fear forces us to be focused, but the ability to stay focused depends on study. It is a sort of Rubik’s cube, but everything begins with deep technical study. There are some specific exercises, like meditation, Zen, but what matters is turning fear into positive tension, one that enables us to give our 110%”. The book will be released in September, just in time for Cremona Musica, that will host the first presentation, in the presence of Mario Brunello and Danilo Rossi: “I would like to thank Cremona Musica for this opportunity – M° Rossi continued – we are glad to take part in an important event like this”. M° Brunello added: “When I went to Cremona Musica I was always impressed by the number of people that are curious about the future of music. People think that musicians are always locked at home and play and play again. But it is like a tornado full of energy, moving toward the future, and Cremona is where you can find the future of music, not just in the exhibition, but in the events too”.